Members of Greek Life at UNT have seen their hard work during the 2017-2018 academic year pay off with recognition for their marketing and academic efforts. 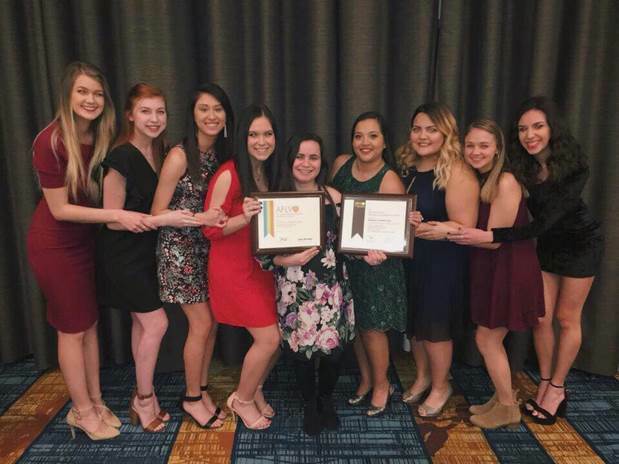 The UNT Panhellenic Association was recognized by the Association of Fraternal Leadership & Values (AFLV) for their outstanding achievement in Panhellenic Division II for council management, membership recruitment, public relations, and self-governance and judicial affairs for the 2017 calendar year. When applying for these awards, the council officers are able to assess operations, use critical thinking, address issues unique to the community culture, and develop new ideas and initiatives a council creates and sustains that make a difference. They also were recognized for an outstanding poster/flyer within the AFLV Marketing & Media Showcase at AFLV Central, and they were the sole winner for this award. The Panhellenic Council has made strides to develop a more intense marketing plan to increase the number of Greek students and bring awareness to the UNT community about what Greek Life does. The UNT sororities received Academic Achievement Recognition from the National Panhellenic Conference for having an all-sorority grade point average above the all-women’s grade point average at UNT for the fall 2017 semester. This is a recognition that the sororities at UNT regularly achieve, and it shows their dedication to academic excellence. 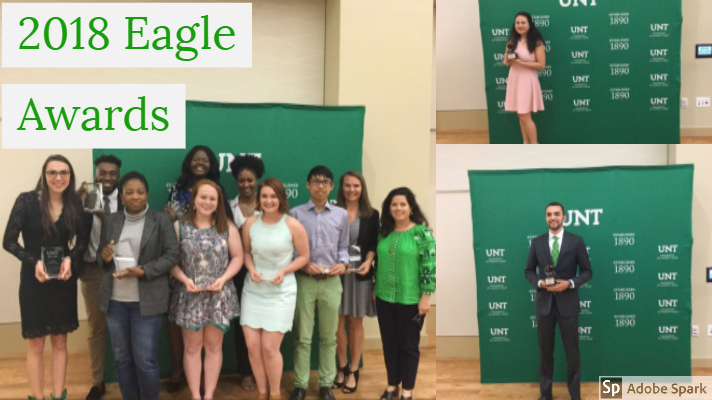 At the 2018 UNT Eagle Awards banquet, which recognizes outstanding student organizations and individual leadership, Greek Life students Christian Cole (Theta Chi) was awarded the Emerging Student Leader award, Barrett Cole (Chi Omega) was awarded the Spirited Eagle award and Alexis Lopez (Kappa Delta Chi) was awarded the Undergraduate Officer of the Year award. In addition, Greek students Barrett Cole (Chi Omega), Daniel Smith (Alpha Phi Alpha Fraternity, Inc) and Eryn Butler (Delta Gamma) received Golden Eagle Awards, which is the most prestigious award that UNT bestows on a student leader. The recipients are those who show a tremendous commitment to co-curricular activities and enhancing campus life at UNT by engaging in considerable service and displaying great leadership, all while achieving excellence in the classroom. For more information on Greek Life, visit http://studentaffairs.unt.edu/greek-life.